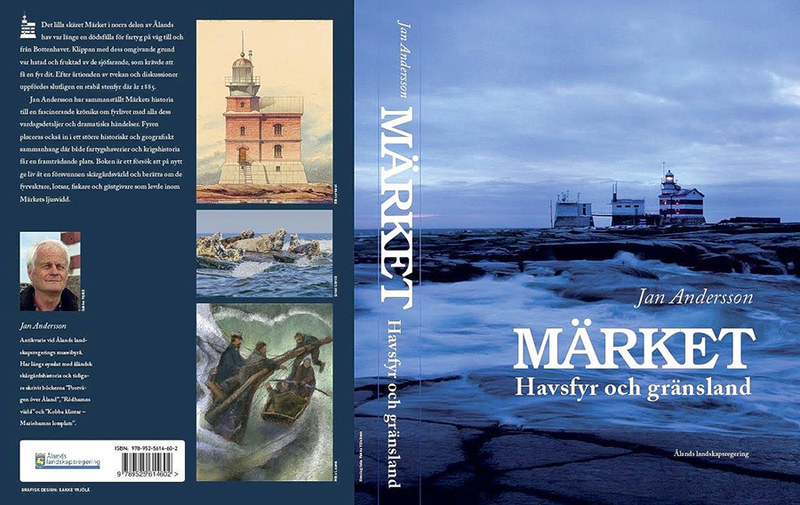 The cover of a recently published book about the Market Reef as it is known to radio amateurs. Written by Jan Anderson from Åland, an authority on the history of the islet. The summer in Europe is the period when many brave people visit the small islet called Märket, located between Finland and Sweden in the Baltic Sea. The locals know this part of the Baltic Sea as Ålandshav, the Sea of Åland. I have never been there, but I used to visit the Åland Islands and sometime ten years ago, I did some research regarding the islet. I shared my observations with the late Bill, NC1L of the DXCC Desk, but he was not impressed. Personally, I do not care anymore about counting entities, points and scores. Many years ago, when I gathered some 250 QSL cards representing the entities on the DXCC list, I came to a conclusion that this part of the hobby is too expensive in relation to what it gives. That was before the Log of The World. Getting QSL cards costs far too much in relation to what they give. I do not need to have a written evidence of a radio contact, do not have to impress anyone, do not have to prove anything. It was different 60 years ago when I started playing with radio transmitters and receivers. It was very different 100 years ago. 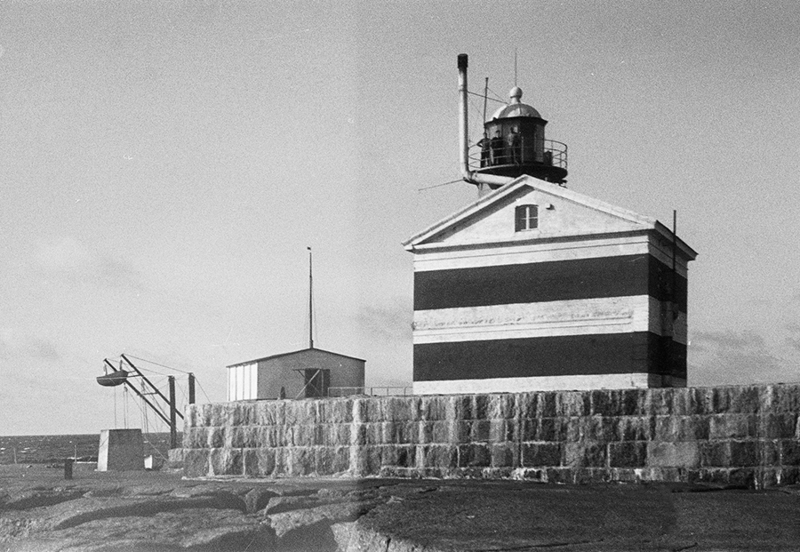 The lighthouse on Märket in 1942. Please pay attention to the lifting gear in the left bottom of the photograph. The lighthouse keeper could retain his boat in the air as there was not chance of mooring the boat due to heavy sea. The islet is very small and dangerous to approach by sea. There is a lighthouse on Märket that has saved many lives. The whole story circles around the lighthouse. More than 200 years ago the Russian troops approached Stockholm. The present-day Finland had been a Swedish possession and was then taken over by Russia. This included the archipelago between Finland and Sweden, the Åland Islands. The border between the new neighbours was drawn half-way between the mainland Sweden and the western tip of Åland Islands. It happened to go through an islet called Märket by the fishermen. The Russians liked the mild climate of Åland Islands and built the town Mariehamn, fortifications and a lighthouse on Märket, among other things. The Märket lighthouse constructed in 1885. Exactly one hundred (100) years ago, as an outcome of the World War I and the Russian Revolution, Finland became independent. Instead of claiming the Åland Islands, where the people are Swedish speaking and voted to belong to Sweden, the kingdom of Sweden abandoned the islands. The old Russian-Swedish border remained intact, going through Märket. Half of the island was now Swedish and half Finnish. The fact that the lighthouse was standing on the Swedish part of the island did not bother anyone, as it served people at sea from both nations. People here are pragmatic. 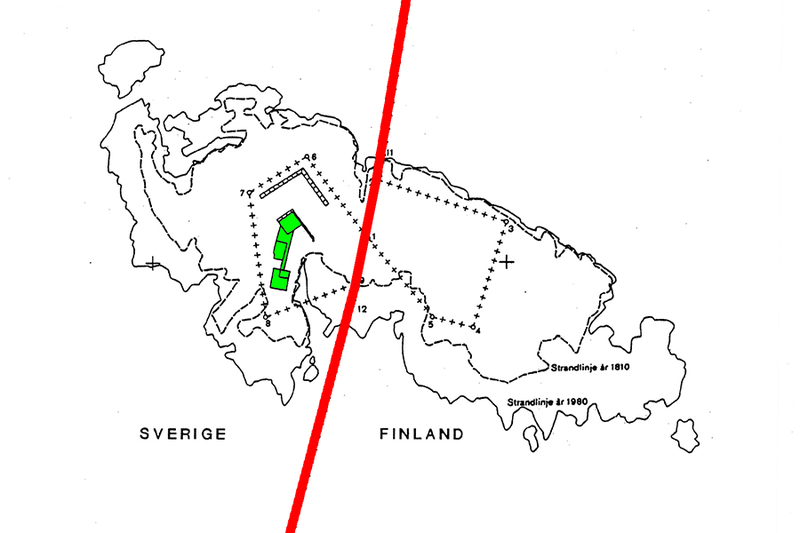 The map of Märket and the borderline - marked in red - between Sweden and Finland - until July 31, 1985. The lighthouse is marked with green and is located in Sweden. At the end of 1960's some Finnish Amateur Radio operators were getting very active, looking for thrill and excitement on the air. Some of them discovered the fact that lighthouses in Finland were administered by the maritime office in Helsinki and a rule of separation in the DXCC program could be applied. If a place under jurisdiction of one DXCC "country" is separated by another "country", then it can count as a separate "country". Åland Islands have limited autonomy and a local government, almost since the independence of Finland and are considered a "country". The original DXCC program was conceived before the WWII, but the criteria and definitions have been modified since then. A lighthouse in Åland Islands could be a "country" because it was operated by Finland. Well, there are at least 100 lighthouses in the Åland Islands and there are some 6,500 islands in the archipelago. Why did they choose Märket with a lighthouse building located on the Swedish territory? Can't tell, but it looks like a deliberate mistake. Anyway, the group of OH operators supplied the appropriate information to the DXCC Desk at the ARRL and on January 1, 1970 the Märket skerry was added to the list as Market Reef. The QSL card of OJ0MA from the early 1970's. There is a lifting hoist on the wall of the building at left. The boat of the lighthouse keeper was suspended in the air because the stormy sea made it impossible to tie it up on shore. In 1977 the lighthouse was automated and the last lighthouse keeper, Kee, OH0MA removed the lifting gear to make it difficult for any future visitors to stay on the reef. This is true ham spirit. Fifteen years later, on August 1, 1985 the border between Finland and Sweden was formally changed so the lighthouse is located on the Finnish side of the island. 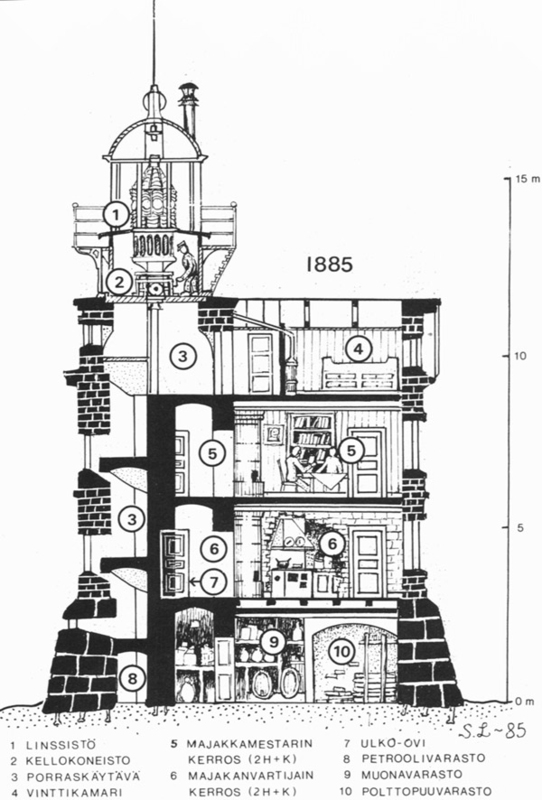 The lighthouse was in Sweden for 100 years as it was constructed in 1885. The Finnish Maritime Administration in Helsinki was responsible for the lighthouses in Finland, including Åland Islands. Åland is a region of Finland and important matters are settled in Helsinki. The foreign policy, defence, monetary system and others. Åland Islands is not a separate country in real life. The maritime authority in Helsinki controlled all 100+ lighthouses in Åland Islands. I remember going to Nyhamn and Korsö lighthouses with some local radio amateurs in 1999/1998 when we were on the air during, the annual Lighthouse Weekend, with the call sign OH0A assigned to the local Amateur Radio organisation. Each time we had to receive a permission from the FMA to enter the lighthouse and use our radios there. We were under the jurisdiction of the FMA in Helsinki but we did not count as a separate "country". I remember well when we were on Nyhamn lighthouse and the Finnish Coast Guard came soon after we had landed and inspected our activities and credentials. 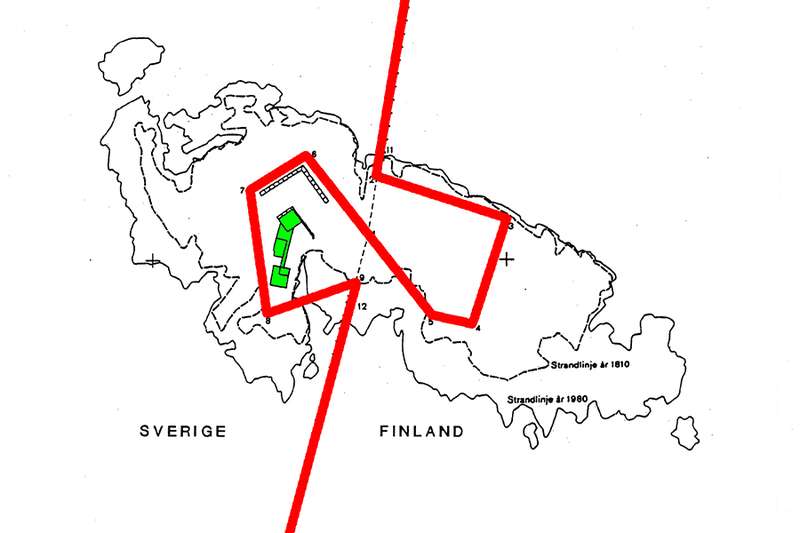 Since August 1, 1985 the borderline (red) between Sweden and Finland is officially modified so the lighthouse (green) is on the Finnish territory. Ten years ago, I asked a few different officials in Finland and Åland Islands about the status of Märket. Here are some replies I have received. Full-size PDF scans of these letters are available from me upon request. Letter from Ålands Regional Government - 13 March 2008: The part of Märket belonging to "Finnish territory" is a part of the Åland province, and situated within the homestead of Signilskär (RN:o 1:0) in the municipality of Hammarland. 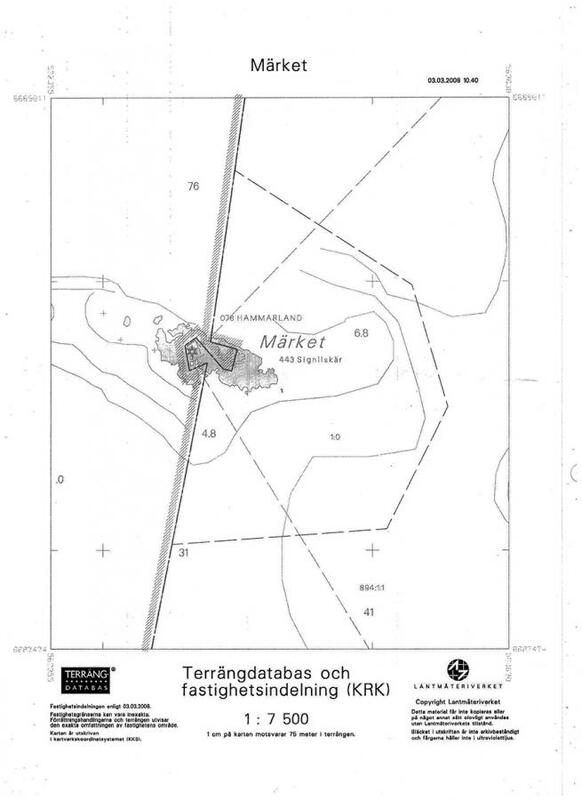 A copy of the Land Survey Office map of Märket. 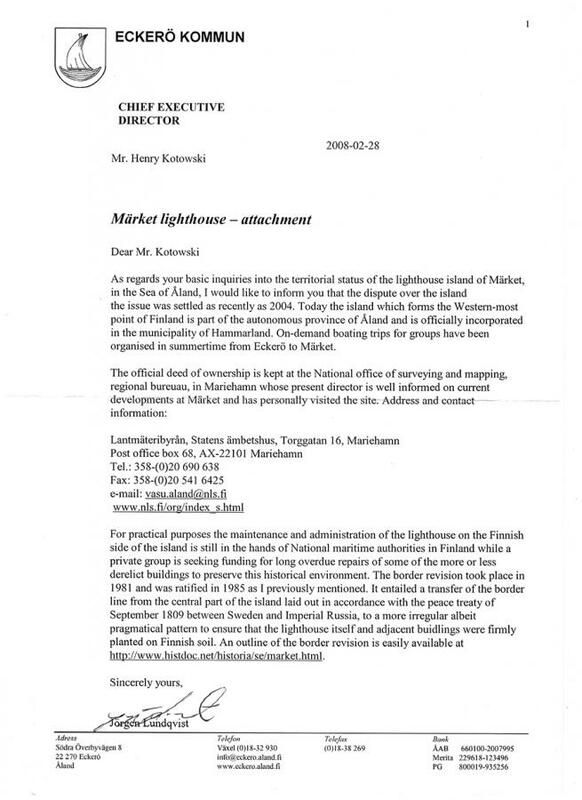 A letter from the Finnish Coast Guard - 22 February 2008: The eastern part of Märket is a part of the province of Åland and due to that is also a part of Finland. 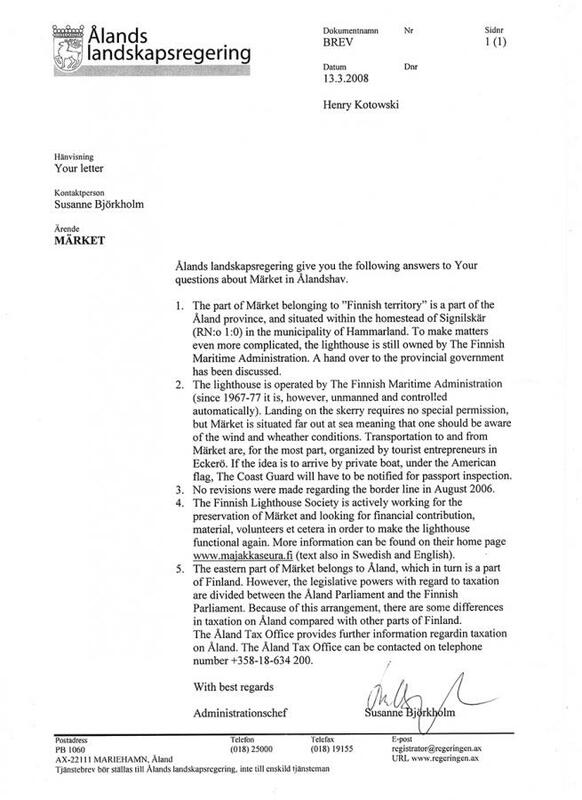 A letter from the Finnish Maritime Administration - 3 March 2008: The eastern part of the reef Märket is a part of Rural District of Eckerö and thus a part of the Province of Åland. Eckerö is the island closest to Märket and connected by road with the main island. 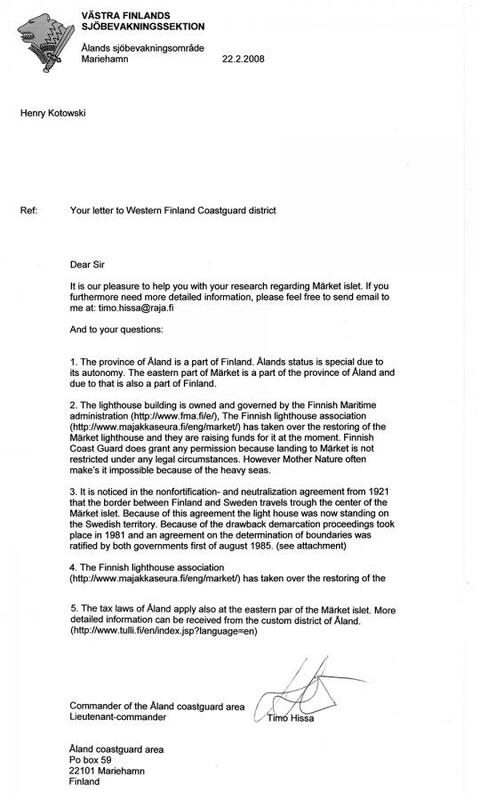 The FMA was later disestablished and as from 2010 all lighthouses in Finland are under the supervision of Finnish Transport Agency - Waterways Section. A letter from the Eckerö Municipality - 28 February 2008: Today the island which forms the Western-most point of Finland is part of the autonomous province of Åland and is officially incorporated in the municipality of Hammarland. 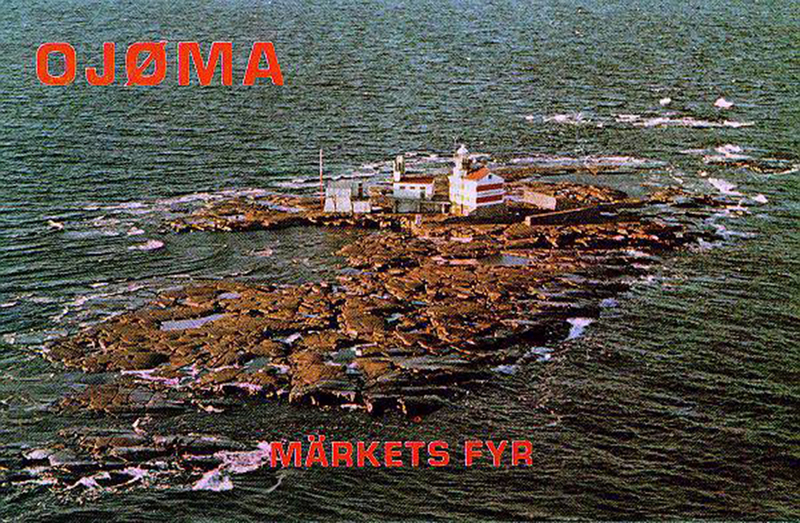 My observations are following: During more than 15 years, between 1969 and August 1, 1985 all radio activity defined as "Market Reef" conducted by the lighthouse keeper and the visitors was from the Swedish territory. It was very close to Finland, but not in Finland. When the infamous Romeo Stepanenko claimed that he was on the air from North Korea in early 1990s, he was actually in Russia. Very close to North Korea, but not in. His operations were rejected. So all these OH0M., OJ0 and other contacts before August 1, 1985 were not from "Market Reef" as defined by the DXCC Rules. This DXCC entity was placed on the list in 1970 upon false information. Some interesting facts about Märket: There are two time zones on this islet, the eastern part is in UTC +2, while the western part is UTC +1. The whole archipelago is rising and the area of the reef is growing. The coastline marked on the map above (with the border marked red) shows the difference between measurements made in 1810 and in 1980. The land of Åland is being pressed upwards. Formal prefix of Märket, as well as the rest of Åland Islands, is OH0. This is information I have received first-hand from FICORA, the contemporary communications authority in Finland. A call sign with OJ0 prefix can be issued upon proper application and costs €171. The correct way of identification for visitors is OH0/own call sign. I remember that the OJ prefix with figures 1-9 was used during the WRTC2012 in Finland. There is another bizarre "island-DXCC-entity" case in this part of Europe. A much larger island, called Ravansaari in Finnish, and Malyj Vysotsky in Russian, located in the Bay of Viborg in the eastern part of the Baltic Sea, halfway between Helsinki and Sankt Petersburg. This Finnish island was annexed by the Soviet Union in 1940, a year later recaptured by Finland, but finally in 1944 taken over by the USSR. In 1963 the two countries signed a commercial agreement and Finland was allowed to use the island for a fee under 50 years for storage and transport of goods. 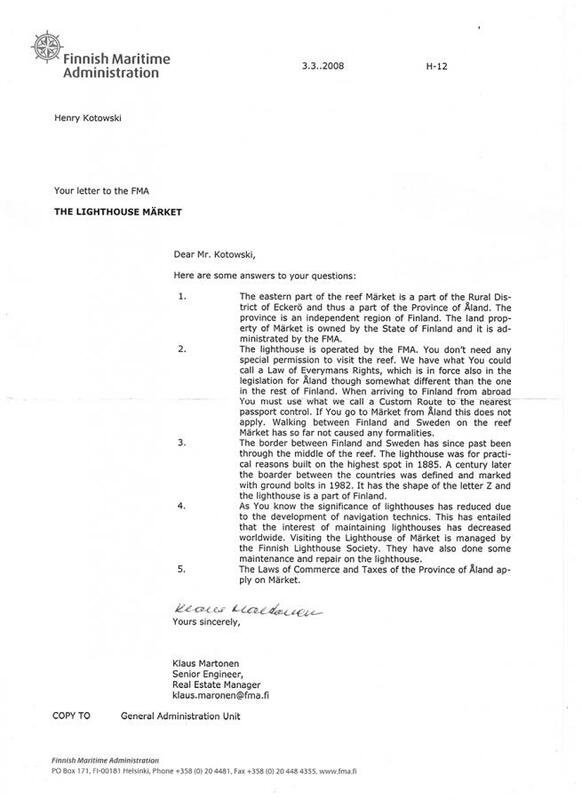 This prompted the same Finnish radio activists to claim a new DXCC entity (R1M). It was removed from the list in 2012 when the lease expired. Do we really need such "countries" or "entities"? There are probably tens or hundreds of places that are leased or rented to other countries for commercial or military purposes. On Svalbard, a part of the Kingdom of Norway, there is a Russian mine and a community in Barentsburg. Does it qualify for a "entity" status? Or, the Saudi Arabian islands of Tiran and Sanafir in the Red Sea. They are on Saudi territorial waters, but Egypt is allowed to use the islands since 1982. It is too late to claim an "entity" in this case, as Egypt has recently decided to give the islands back to Saudi Arabia. There are countless military bases on foreign territory. Guantanamo on Cuba counts as an "entity" in spite of the fact that the rent paid by the USA to the Cuban government is not accepted since 1960. Is the 1903 lease agreement valid without payment being made? The British base on Cyprus counts as an "entity", but I can name a few hundred military bases on foreign land that are not. The Green Line, the no man's land between Northern Cyprus and the Republic of Cyprus, controlled by the soldiers of the United Nations Peacekeeping Force In Cyprus, for example. The Sovereign Military Order of Malta counts as an entity. A religious organisation without any significance is a "country"? It is recognised by about 100 countries, but far from all. Have we gone nuts? NATO has at least potential and significance, so why not put the "NATO country" on the list? Other international organisations are "entities" but why limit ourselves to the International Telecommunications Union and the United Nations? There is at least a dozen international bodies that can be included in the list. The World Health Organisation, the World Bank, the Red Cross, the Red Crescent, and so on. Never understood why some Greek islands count as countries. The Dodecanese archipelago, consisting of over 100 islands, is an entity. Crete is another puzzle. I ask questions when I do not understand things. I fully support The ARRL organisation, even though I do not participate in the DXCC program. My private opinion is that The ARRL does more for the benefit of Amateur Radio globally than all other societies combined. There are two options for the entity chasers. One is to hire a few international law advisers and increase the list to at least a thousand (1000) entities. Humans want to have more and more of everything. Instead of "century" in the acronym, the letter "C" will stand for "chiliad". This should not be difficult in the Internet age. The second option is to revise the criterion and put on the list only real countries that have people and land, with a government and borders. Still there will be changes on such list because of wars, earthquakes and international agreements. Some countries might disappear if the ambition of the Brussels officials to create a super-state in Europe become reality, but new countries will be created by separatists. No risk for stagnation, but at least the rules will be clear. The DXCC list is used as a point of reference by many contest sponsors, DX clubs and organisation. Comprehensible criteria, written in simple English will help avoid confusion for an average Amateur Radio operator worldwide. I am aware that the original rules have been adjusted and revised a few times since 1935, but the reality is changing fast. How to determine the "entity" of a contact when the operator is in one country and the antenna is in another? Do we contact people or stations? Will a QSO with a fully automatic software-controlled station count? A radio contact between two robot stations is feasible, does it count? One final remark: I must commend the authorities in Finland and Åland for their response and civil service. They are professional, helpful and competent.